Beyond our brothers and sisters. Beyond our grandparents, aunts and uncles. Beyond even those who might be considered our kin. Beyond them all, our people had other people to whom they were connected in a critical way. People we need to document in our genealogy every bit as much as we document our own kin. It may include anyone whose life intersected with that of our kin — as lives intersect when people we research are fellow travelers in some of life’s tough roads. They may have been fellow orphans in institutions, fellow prisoners, apprentices and indentured servants, neighbors, business partners, or military comrades — and we want and need to document their lives and the way that impacted our own kin. The methodology they outline and urge on the The Beyond Kin Project website can be used with any beyond-the-kin relationship — relationships that any genealogist will recognize as falling within what Elizabeth Shown Mills calls the FAN club: Friends, Associates and Neighbors. But where it’s needed the most is in that relationship of the slavemaster and the enslaved. Effective genealogical research on America’s enslaved people requires access to the documents and life stories of the slaveholders who claimed ownership of them. The slaveholders’ stories, meanwhile, are incomplete without the fullest possible accounting of the enslaved persons who were integral to their comfort, wealth, and position in society. 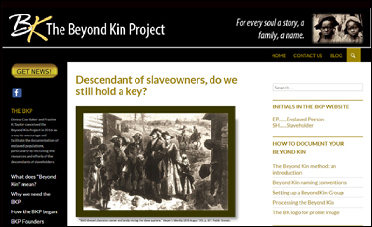 While the two groups of people in most cases were not genetically kin, they have relationships “beyond kin.” Slavery intertwined their lives and connected their family histories. Genealogists who descend from slaveholders (SHs) are uniquely positioned to revolutionize genealogy for their African American colleagues. You undoubtedly feel sympathy for the genealogical challenges facing the descendants of the enslaved persons (EPs) who once gave your ancestors wealth, comfort, and social status. But what if you start seeing their challenge as your own? • The answers for antebellum African American family trees lie predominantly in the records of the white families who claimed ownership of them. • The puzzles of enslaved identities can best be solved by studying them as groups, working outward from the SH’s records. • You will neither know nor understand your ancestors until you fill in the fuller picture of those who were integral to their most intimate daily lives. • If you’ve read this far, you might be ready for the genealogical challenge and enlightenment opportunity of a lifetime. This will be it. It’s a great idea — it’s essential research for all of us, whether we descend from the slavemaster or the enslaved or from those who were neither. Researching beyond our own kin to those whose lives intersected the lives of our ancestors in any way is part and parcel of good genealogical practice. In our own way, in our own time, we can all take part. Enriching our own family history, and that of everyone else with whom our families came into contact. This is exciting to see. Slavery is part of all our histories, in one way or another. This will be a great resource for putting together the bits and pieces that hopefully can fill in the story of real people in the general outlines we have. I remember when I first learned that researchers had to learn about the daily life of slaves through archaeological digs, and by tracking household expenses. That stunned me. I hope I can provide something of meaning to this project. I may even find myself making use of it. I am about to start research on some lines that migrated west from Kentucky before the Civil war, and before that, Carolina and Virginia. Many of my other lines originated from New England, where white lives often intersected with black lives in unexpected ways. And there are “back hall” stories about some of our heritage. I suspect some of my story might fit somewhere in “Beyond Kin”. I am looking forward to participating. Thank you, Judy. Very much like the Slave Name Roll Project, which I believe was originated by Schalene Dagutis on her blog Tangled Roots and Trees (http://tangledrootsandtrees.blogspot.lu/p/slave-name-roll.html). I love the Beyond Kin project and am hoping to incorporate it (and Slave Name Roll Project) into my own research into several slaveholding ancestors in North Carolina. I had heard of Beyond Kin recently, but came back from NGS and looked it up again. I enjoyed your ‘Kaleidoscopes…Inclusion’ session at National Genealogical Society Conference. I think it would be great to have Donna Cox Baker and Frazine K. Taylor present on Beyond Kin at a future NGS conference. It would also be good to see sessions (maybe panel) on ways for genealogists with slaveholding ancestors to conserve and share findings. The time is now! I have been searching for my enslaved ancestors for over 30 years. I would really like some help. Maternal relationship is confirmed by a 3,586.4 cM match between [[Allman-716|Karen Allman]] GEDmatch Mxxxxxx and mother [[Campbell-20029|Donna Campbell]] GEDmatch Mxxxxxx. Coding those referenced in that way creates a clickable link. With that inspiration, in the same way that == Research Notes == can be added at the end of a profile, perhaps I can code == Beyond Kin == and create such cross refrences. In the enslavers profile I can list with links those enslaved and the document that established the relationship. Likewise, in the profile of those enslaved such an area can exist in the profile with the linkage back to the enslaver. Further connection can be achieved by a shared photo, perhaps with a combination of the BK logo and a specific reference to the estate/plantation etc. I’d be interested in any feedback on this scheme. Update: see Lay-122 for an example of how I’ve used this technique.